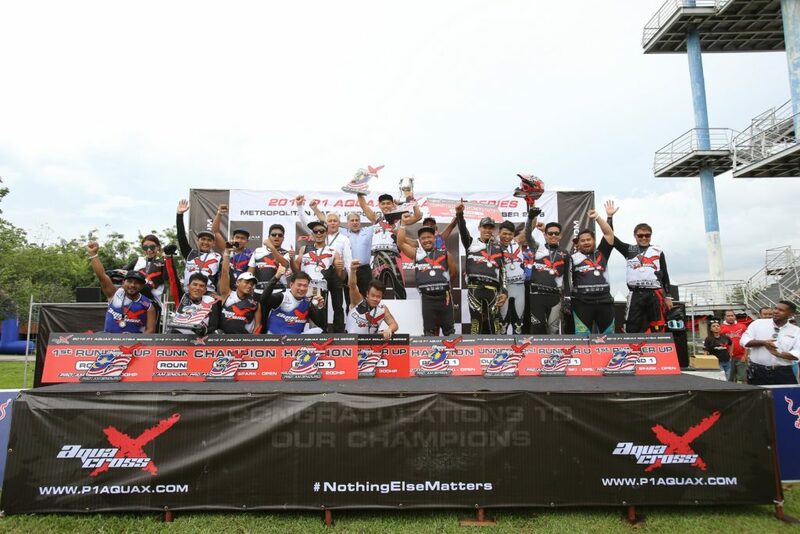 KEPONG, 30 October 2016: Held for the first time in Malaysia, the inaugural 2016 P1 AquaX Malaysia Series completed an impressive debut with a highly successful first round of competition here at the Metropolitan Lake at Kepong today. Organised by P1 Marine Motorsports (Malaysia), Day 2 of this weekend’s Round 1 action saw a total of 24 riders, including some of the best jet skiers in the country, competing in six races and across four categories. The Enduro category, which is divided into 200hp and 300hp classes, featured the most hotly contested races of the weekend, with eight riders competing in the Enduro 300 category and six riders in the Enduro 200 category. One of the youngest riders in the event, 19-year-old Bryan Chia, followed up his victory yesterday with another win today to take first place in the Enduro 300 category with 55 points. Bryan also emerged as the overall champion for the Enduro Cup category, which is open to all Enduro riders regardless of engine class. “I’m very happy to win and very grateful to P1 AquaX for holding this event for the first time in Asia. It was fun and I hope to maintain my performance in the next two rounds,” said the 19-year-old, who has been racing in Jet Ski competitions around Asia for the last five years and hopes to become a World Champion one day. Second place in the Enduro 300 for the weekend was 21-year-old Lim Hong Hao, while 24-year-old Saifullah Nazar settled for third. Christopher Keasberry, one of two Bruneians in the competition, put his 18 years of racing experience to good use as he picked up victories in three out of three races in the Enduro 200 class to secure first place here in Round 1. “I have been racing for many years but I think this is one of the best performances in my racing career because I have never done so well in an endurance race. I have been training intensively since August and keeping myself in shape, so it’s a good win,” said the 47-year-old. Second place in Enduro 200 was Mohd Suffian bin Saidi, while Rosli Ghazali took the final podium spot. The Sprint Spark category, which is a newly launched class designed to attract entry-level amateur and semi-pro riders racing on sit-down jet skis, was contested by six riders this weekend. After winning one race yesterday and emerging third in the other, 19-year-old Mohd Danial Mohd Shariff led the Sprint Spark standings coming into Day 2 and continued his fine form with victories in both races today to collect 75 points and take first place. “I feel grateful for this victory as I have been training very hard every week. I have been jet-skiing for five years and this is my best performance so far,” said the 19-year-old who hopes to turn professional soon. Finishing in second place for the Sprint Spark category this weekend was 34-year-old Raja Nazrin Shah (65 points), third place went to Saifullah Nazar (63 points) and coming in fourth was Megat Redza (61 points). The only female rider in the event, 29-year-old Yushi Chan, finished tied in fifth place on 50 points with Mohammad Farid Mohd Zain. In the Sprint Ski class, Hj Idzam Norhaidi Hj Mashud won 3 out of the 4 races in his category this weekend to comfortably clinch first place with 77 points. “I would like to thank the organizer for this event. I was racing against competitors much younger than me so I feel very happy to achieve this result in the Sprint Ski category. It has been a long and tiring but very fulfilling day,” said the 39-year-old, who is the only other Brunei rider in the competition. Coming in second was 26-year-old Muhammad Fadhli Hashim, who won today’s final Sprint Ski race, with 69 points followed by his younger brother, 16-year-old Muhammad Syahmi Hashim, in third place with 62 points. More than RM15,000 in cash prizes were awarded to top finishers in this weekend’s races, while participants in the Sprint Ski and Enduro categories also picked up international ranking points based on this performances. Riders in the Sprint Spark category picked up national ranking points. Prizes were presented by Tuan Haji Mohd Noor b Ariffin, President of Persatuan Sukan Air Bermotor Malaysia (PESUAM), and Lisa Barsby, Head of P1 AquaX Global. With this event being the first ever sanctioned for Malaysia and Asia, the global championship’s principal present on site was extremely impressed with the overall organization and execution. “I’m very impressed with Malaysia. The level of marshalling is fantastic – the team here is disciplined and has a very good attitude towards training and improvement. The quality of the racing was also good. I believe once we get more riders participating, we will see even further improvement in the racing quality,” said Asif Rangoonwala, Chairman for Powerboat P1 Management Limited. The next two events in this three-event Malaysia series will be held at D’Island Residences, Puchong on 26 & 27 November and 10 & 11 December (Grand Finals), where the overall Malaysian Champion will be crowned. Entrance to the event will remain free for members of the public who wish to spectate.